Two failed cheesecakes were in the fridge. One had a soggy crust and the other deep cracks and burnt edges. They were the first two attempts in making my Mom’s cheesecake. A water bath leak and then no water bath had put the two in the disaster category. I didn’t have the heart to throw them out. There had to be a way to utilize their goodness. A quick inquiry with some blogger friends provided the answer. 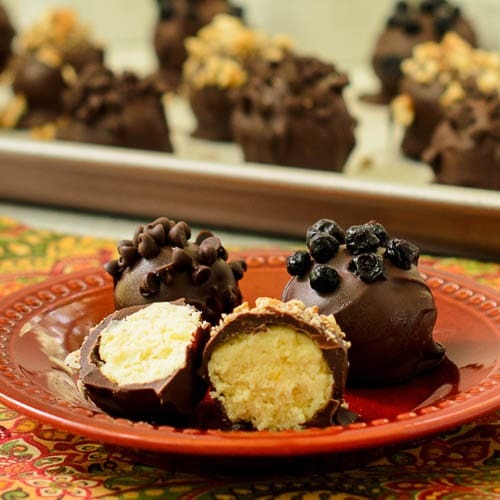 Thus Cheesecake Truffles turned the failures into heavenly treats. You do not need to have a cheesecake disaster to make these truffles. All you need is leftover cheesecake (or store-bought no-bake cheesecake filling), chocolate chips, and toppings. Get your hands messy by scooping out and rolling the filling into balls. Freeze ’em, dunk ’em, top ’em, and you are done. Well, except for popping the finished tasty bites into your mouth which is ultimately the best part. What toppings to use for cheesecake truffles? There are many possibilities. I used chopped toasted pecans, mini-chocolate chips, and dried blueberries. You could match your cheesecake filling (if not plain) with a topping like pepitas for pumpkin cheesecake. Can you believe it is almost time to think about fall desserts? I can’t. I’m hanging on to summer as hard as I can. Some notes on making the truffles: Melt the chocolate chips in a bowl over simmering water. Keep the water simmering because the chocolate will thicken as you are dipping the frozen cheesecake balls. Put the bowl back over the simmering water to thin the chocolate as needed. You may need to dry off the frozen balls if condensation forms on them after taking them out of the freezer and before dipping. It happened to me because it was a rather humid day. The chocolate did not want to stick to the ones with condensation (plus the water may seize the chocolate somewhat). Sprinkle the toppings on right after dipping. The chocolate will set fast and if you wait the toppings will not stick. 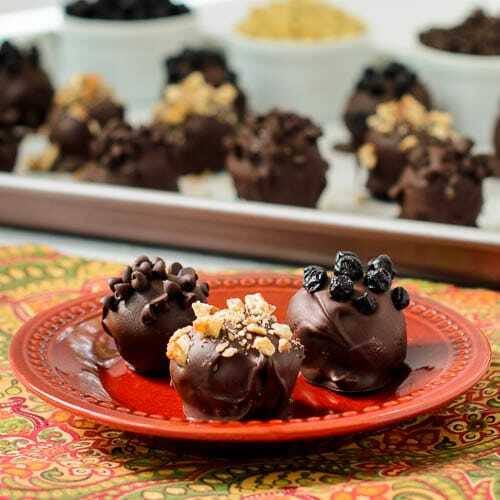 These cheesecake truffles are made with leftover cheesecake that is dipped in chocolate and topped with nuts, mini chocolate chips, or dried fruit. Finely chopped nuts mini chocolate chips, dried fruit, sprinkles, or toppings of your choice. Roll cheesecake filling into 1-inch balls. Place on a parchment paper lined baking sheet and freeze at least 1 hour. 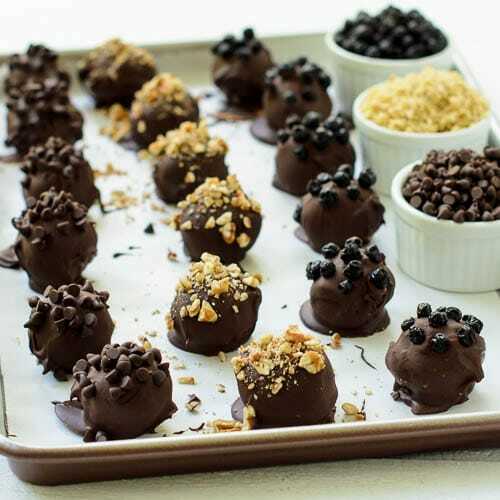 Dip the cheesecake balls in the chocolate, allow excess to drip off, and place on a parchment lined baking sheet or tray. Immediately sprinkle on topping before chocolate sets (will set quickly due to the cheesecake being frozen). Continue with remaining cheesecake balls. If chocolate becomes thick, put it back over simmering water to warm and thin out. If chocolate does not cling to the cheesecake balls due to condensation (moisture), use a paper towel to dry them before dipping in chocolate. Keep truffles refrigerated when not serving. The number of truffles this recipe makes depends on the amount of cheesecake filling you have if using leftover cheesecake. As a cheesecake-failure myself, these totally sound rriiiightt up my alley! I’ve tried numerous times in the past to make a good one, but the texture always turns out funky. Love that these are bite-sized and smothered in chocolate! And the best part is there is no wasted cheesecake. my chocolate cravings have definitely kicked in right now.. these look amazing. Darn those chocolate cravings. Looks like you need to satisfy them real soon. You are welcome Sarah and I think they would be fabulous at a party too. Put these in a box, walk them to the Post Office and ship them to me ASAP because I’m drowning in a puddle of drool here! I would Anita except we ate them all. I’ll have to send you some next time. I love these!! and love that you didn’t throw out the cheesecake! These are great because it’s like bite sized cheesecake .. yummmm! Looks delicious! Truffles is always a good answer when cakes and cheesecakes don’t go as planned. Glad you utilized the filling after your attempts. Truffles and trifles are both perfect to utilize the failed cakes.